A Frenchie may be in your future. Congratulations on making the decision to adopt a French bulldog puppy. If you live in the Sunshine State, you'll be happy to hear the state has a French bulldog rescue organization standing ready to help find the perfect dog for your family. But don't just look in Florida, expand your search. Visit the website of the Florida French Bulldog Rescue organization and check out the dogs and puppies they have for adoption. 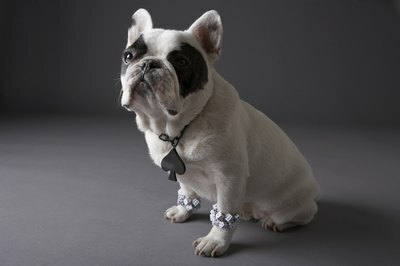 If they don't have any puppies, ask to have your name put on a waiting list for a French bulldog puppy. If they do have a puppy or young dog that may interest you, arrange to meet the dog and decide id you want to follow the steps to a successful adoption. The Florida French Bulldog Rescue, as are generally all rescue organizations, is selective about where they place their charges. You will have to fill out an extensive multipage application and submit to a home visit. Some organizations will allow you to fill out the application prior to finding a dog so it's ready when a dog becomes available. Contact the Florida chapter of the French Bulldog Rescue Network and inquire about dogs. On the web site, click on Florida on the map and send an email to the address provided. This will put you right in touch with their Florida representative. Though this is a national organization, it has an active Florida network of "Froggy" lovers who work hard to find homes for French bulldogs. Ask if they have any puppies in rescue or if you can put your name on a waiting list for a Frenchie puppy. Note that most rescue organizations have made it possible for you to adopt a puppy even if you are not in the same vicinity of the puppy. They will have a home visit conducted of your home by a volunteer in your area. If you are approved, the puppy can be transported by a series of transport volunteers whose main mission is to provide rides for dogs going to forever homes. So don't despair if you live in Key West but your dream puppy is in Tallahassee. Where there's a will, there's a way. Check out Petfinder and perform a search within a specified radius of your zip code. On Petfinder.org, you can use drop-down menus to select the kind you pet for which you are searching. You can be very specific and choose the species, gender, breed and age of the dog you want. You enter your zip code and you will be rewarded with a list of all Frenchie bulldogs in rescues near you. Many of them offer photos of the dogs and if you are lucky, you may find a puppy. But be forewarned: Purebred puppies in rescue get adopted very quickly. If you cannot find a Frenchie puppy on Petfinder right away, check every day. If you are willing to take a young dog instead of a puppy, your chances of finding a Frenchie in need of a home increase drastically. In fact, the older the dog you are willing to accept, the greater your choices. Though rare, purebred puppies do come into rescue as a result of a variety of situations: someone purchases a puppy but cannot keep it; a pregnant Frenchie already in rescue has given birth to a litter in need of homes; a local animal control agency has had one dropped off and has turned the puppy over to the purebred dog rescue organization. How Long Should Newborn English Bulldogs Nurse? How Early Can a Saint Bernard Puppy Be Adopted Out?